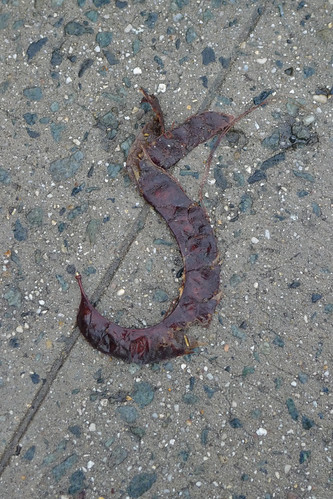 peoplewatching is great, but detritus-watching is the best. Wait, did you really see that, take a picture and then come back later and find it arted up? Also, sweet jesus, lady! I opened up that link in a new tab and didn't realize my speakers were up at full volume! Definitely helped with the post-lunch coma state. 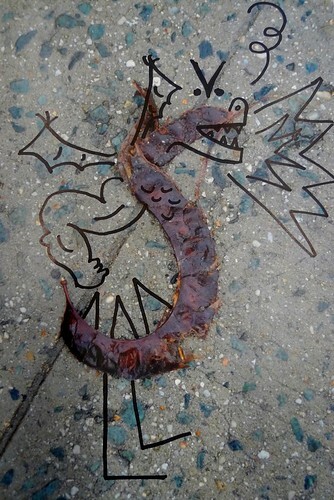 no no, i saw it, thought it looked like trogdor, took a picture, and drew on it. i should've warned you about how loud strong bad can get - it's true, that link is intense. i meant to get up and check out my shelves for you before work this morning, but i was consumed instead with finding a bus because joe said i couldn't gimp down to the subway on purpy. oh, purpy! you're wise to be leery of some of those recently-read books; the ask, for example, lowered my IQ and shortened my lifespan, i'm pretty sure. this is why i need to catch up on THUNDERTOME.